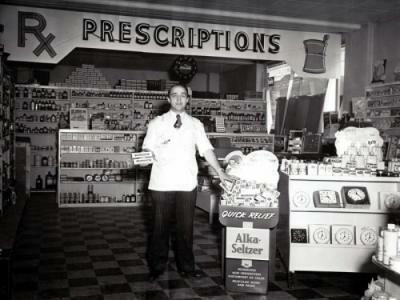 Black and white photograph of the interior of Mack's Pharmacy, with owner Mack Stoddard posed with some alka-seltzer in front a display featuring Speedy Alka-Seltzer. A sign above advertises prescriptions. Stock on shelves includes prescriptions, clocks, beauty products, etc. Store operated 45 years with his wife Darlene Condie(?) and children, Bill, Jim, Dave, Joe, Chuck and Tom. Daughters: Marian and Ruth-Ann. He also founded Mack's Sundries on west south main by the Box Elder County Bank and Alberta's Woman's Ready to Weak on west side of main street next to Zundals Men's Wear.